Trump has been saying since his campaign that he's willing to leave NAFTA, which he believes is unfair to the United States. Last Sunday, he tweeted: "We are in the NAFTA (worst trade deal ever made) renegotiation process with Mexico & Canada. Both being very difficult, may have to terminate?" Robert Lighthizer, the top U.S. trade official, told CNN Trump "is not interested in a mere tweaking of a few provisions and a couple updated chapters." The Mexican Ministry of Foreign Affairs released a statement last Sunday saying Mexico would not "negotiate NAFTA...through social media or any other news platform." The ministry also said Mexico will continue "seeking a beneficial result whereby the three North American countries win." 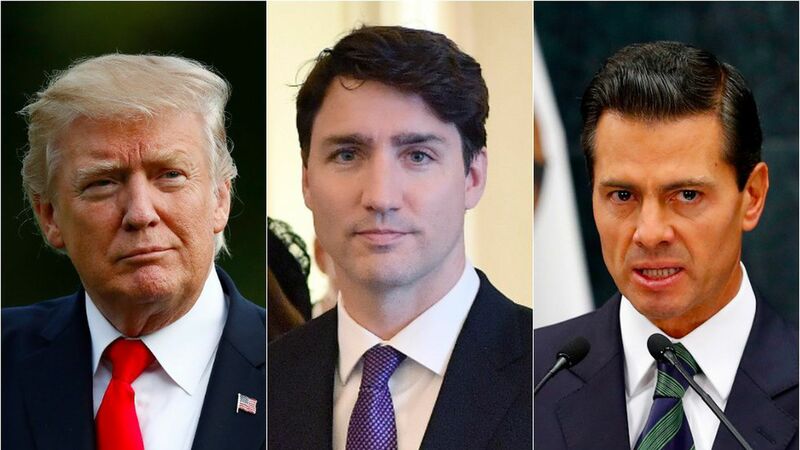 Reuters reported on Saturday that the three countries are focusing on ways to "enshrine Mexican President Enrique Pena Nieto's sweeping energy reforms" in a new NAFTA. Promoting "certainty of trade and investment"
Prime Minister Justin Trudeau said he doesn't "see anything changing" in the negotiations, per the Toronto Star, and dismissed Trump's remarks as "heated rhetoric." Foreign Affair Minister Chrystia Freeland said all parties should be "prepared for some moments of drama," and that it's "an expected part of any trade negotiations." New chapters on labour and environmental standards, as well as gender and Indigenous rights. Protecting cultural exemptions and supply-management for dairy and poultry. Modernization: All partners agree that the agreement needs updating. Arbitration: North American companies can force a country to "do away with measures that violate the trade deal" through independent arbitration, and Trump wants to get rid of it. Rule of origin: Vehicles assembled in Mexico aren't subject to import taxes if a required percentage of it was made in North America, and Trump wants to increase that percentage. He has the support of a major U.S. automobile union.